#stampinup #faithfulinkspirations In yesterday's post I shared a dilemma that I often face when I purchase a "must have" stamp set. Sometimes when it arrives in my home, I have forgotten what I'd planned to create with it and it will sit on the shelf waiting patiently for some ink. "Timeless Textures" was a "must have" stamp set that I neglected for far, too long! I did some Pinterest diving and found inspiration for yesterday's card. Today's card was inspired by a card created by jadoherty on Splitcoaststampers.com. I CASEd (copy and share everything) jadoherty's use of the various textures in the "Timeless Textures" set. The three horizontal textures are stamped in Mint Macaron onto a Whisper White panel. The splatters and "coffee ring" are stamped in Dapper Denim. I'm really loving this color combo!! 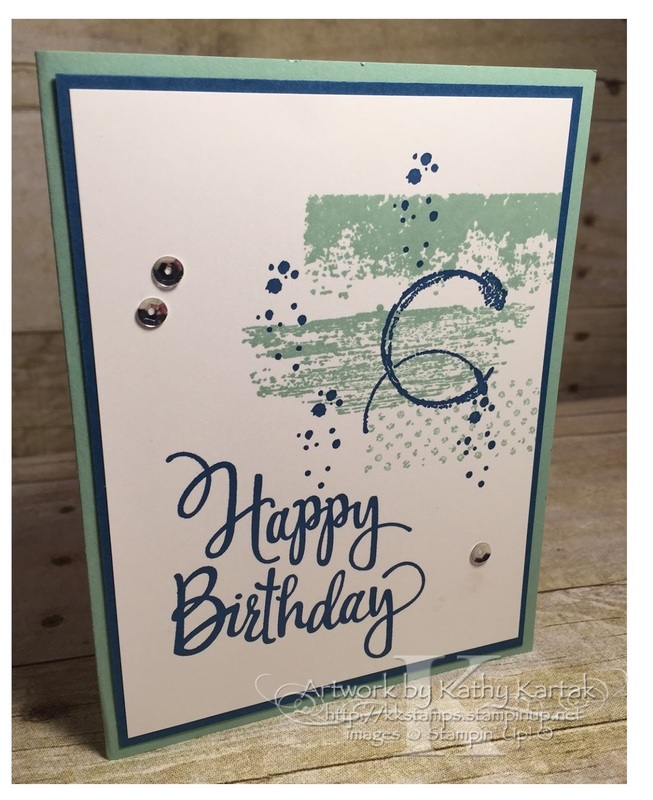 The sentiment is from my favorite single stamp from the 2016-17 Stampin' Up catalog: "Stylized Birthday" and it's stamped in Dapper Denim, too. I adhered the stamped panel onto a Dapper Denim mat and then onto a Mint Macaron card base. For a finishing touch, I added three silver sequins from the Metallics Sequin Assortment using my favorite Fine-Tip Glue Pen. This card makes me so happy! You could create a stack of these in no time flat! I think this would be super adorable in Blushing Bride and Calypso Coral!